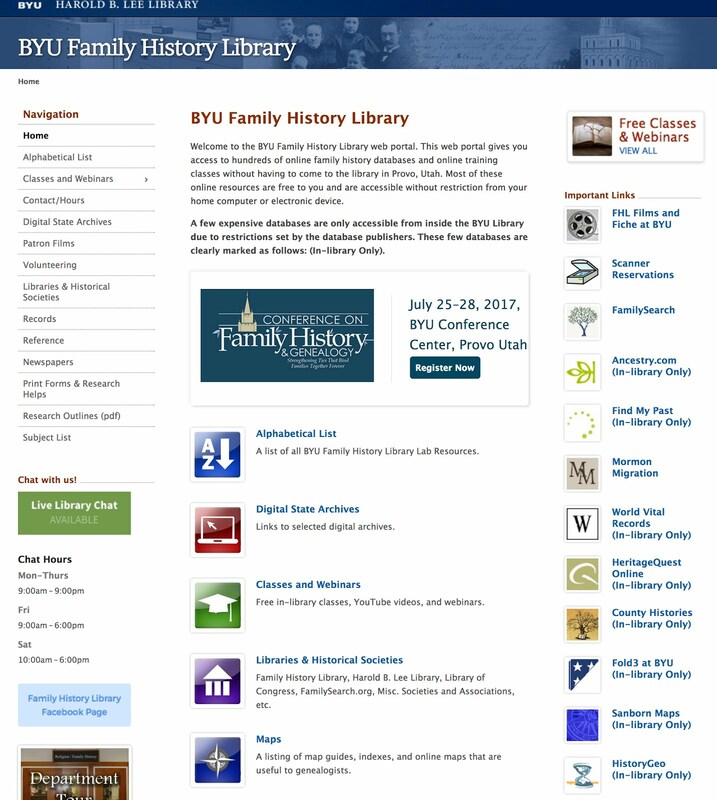 The Brigham Young University Family History Library website features an extensive list of online resources. Here is a screenshot of the beginning portion of the list. The list includes many genealogically related programs, databases with specifically helpful genealogical information and other websites of general interest. Access to many of these websites is restricted to patrons using computers in the Family History Library itself. These particular items are marked with the designation "in library only." However, the links to generally available resources are accessible even from your home computer. The programs that are available only when physically present in the library are certainly a justifiable incentive for a research visit to the BYU campus. The term "underused" is generally overused in genealogically related writings. But in this case designating the online resources at the BYU Family History Library as underused is an understatement. Despite the fact that the list is prominently highlighted on the startup page for the Library, I see very very few patrons using its resources. This is the case even when the resources and the list could be specifically helpful to the patron's research. Although some of these categories are redundant each of them needs to be explored. 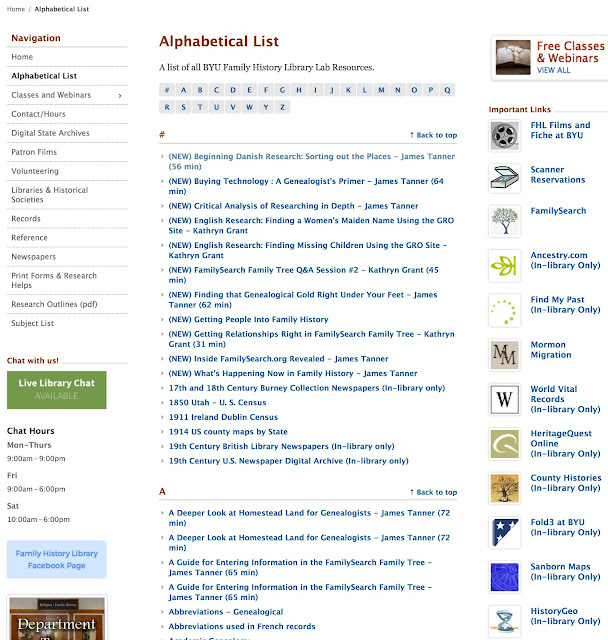 In addition to the extensive alphabetical listing of resources, there are a few more generally used websites along the right-hand border of the Library's startup page. It is generally unfair to compare the list of online resources available at the BYU Family History Library with those available at the Family History Library in Salt Lake City, Utah because in addition to those online resources listed on the BYU Family History Library webpage there are hundreds, perhaps thousands, of additional resources available from the general online items from the Harold B. Lee Library where the BYU Family History Library is located and operated. In addition, the BYU Family History Library also has the basic genealogy programs featured on the FamilySearch.org Portal programs that are available in Family History Centers around the world. All of the large online, library editions, database programs are available for in-library use: FamilySearch.org, Ancestry.com, MyHeritage.com and Findmypast.com. Use of the subscription programs is limited to doing research. Your personal family trees are only available if you sign in to the programs with your subscription login and password. Other programs available from the BYU Family History Library which are also generally available on the Family History Center's portal include WorldVitalRecords.com, Fold3.com, and ArkivDigital.com, the Swedish database. Stay tuned for some of the highlights of the BYU Family History Library online collections.